My 4 year old daughter wanted to be a superhero. We walked the halloween store to find out that the wonder women costume and accessories that she decided she wanted would cost us at least $100 and the costume was very cheaply made. So I decided I would make the costume myself from head to toe. After everything was made I only paid out of pocket $60. We saved money and made a very cute Wonder Woman costume. Aubree was smiling all night. Oh my goodness!! This is adorable!! 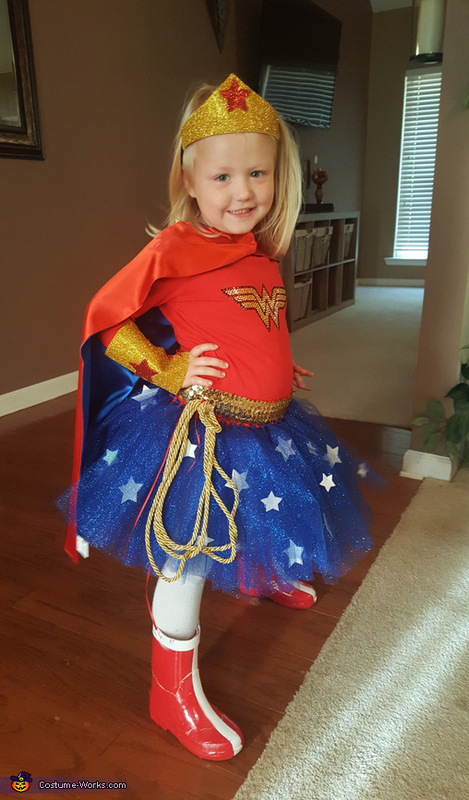 My daughter wants to be wonder woman this year as well and I would love to hear how you went about make this adorable costume! And tips, tricks, and ideas would be awesome!